Herbs are natural plant materials, and are vulnerable to all of the elements including air, light, humidity, and temperature. Whether you purchase your herbs already dried or you harvest herbs straight from your garden, it is important to know proper storage techniques. Correctly storing your herbs will help prevent from deterioration of color, scent, and flavor, and will also help protect from insect damage or infestation. Some of the best herb protectors are colored glass, kraft bags, or foil sacks, which should always be stored out of direct contact with light. Herbs lose their color and flavor with age, so always know your source, and purchase only what you will need within a short time. - Herbs and spices are very sensitive to fluctuations in temperature, moisture, and light. Store in a temperature controlled environment with limited light, heat, and moisture. Ideal storage temperatures are 65-73 degrees and relative humidity should not exceed 55. Light (including incandescent and fluorescence) will strip your botanicals of their natural color and remove many key elements. An ideal location is a dry pantry, cupboard or closet. - All herbs and spices have a relatively fixed shelf life, and we recommend that you only purchase what you will use within a short period of time. We always recommend using material within a few months of purchasing it. 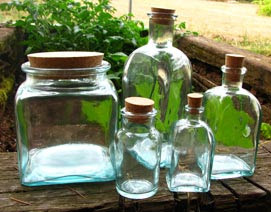 - The best container for storing your herbs is glass, preferably colored glass. Clear glass is also acceptable, as long as the herbs are stored away from direct light exposure. Glass is great for storage because it provides an airtight seal while allowing the herbs to breathe. Plastic containers can also be used for storage, but they do not allow for the herbs to breathe. However, they are convenient, inexpensive, and readily available. Kraft bags and foil sacks are also good choices for storing herbs, but they must be sealed well to keep out light, air, and insects. - Some herbs and spices keep longer than others. The best guideline to follow is: no longer then 8-12 months for spices and leafy herbs, and no longer then 14-16 months for roots, barks and berries. Powdered herbs have a shorter life span, usually around 6 months. - Purchase your herbs in a cut and sifted or whole form since powdered herbs have a shorter shelf life. Grind your herbs and spices just before using them using a mortar and pestle. For larger quantities, a food processor, coffee grinder, or electric spice mill work well. - Purchase your herbs from a reliable source. - Avoid purchasing herbs which have been stored in clear containers on well lit store shelves. This light has already degraded the quality of the herbs, this is readily apparent when comparing fresh herbs to those which have been sitting on store shelves for long periods of time.